Commissioned by the Government of Québec and designed by ABCP Architecture, the objective of Place des Canotiers was to transform a vast surface parking lot into a public place by creating a multi-storey parking structure at the foot of Old Québec, a UNESCO World Heritage Site. Part of this transformation includes an Artifact Wall made with nearly 13 kilometers of western red cedar timbers machined with a precision of 1mm, designed to remind one of the industrial past of wooden wharf piers. 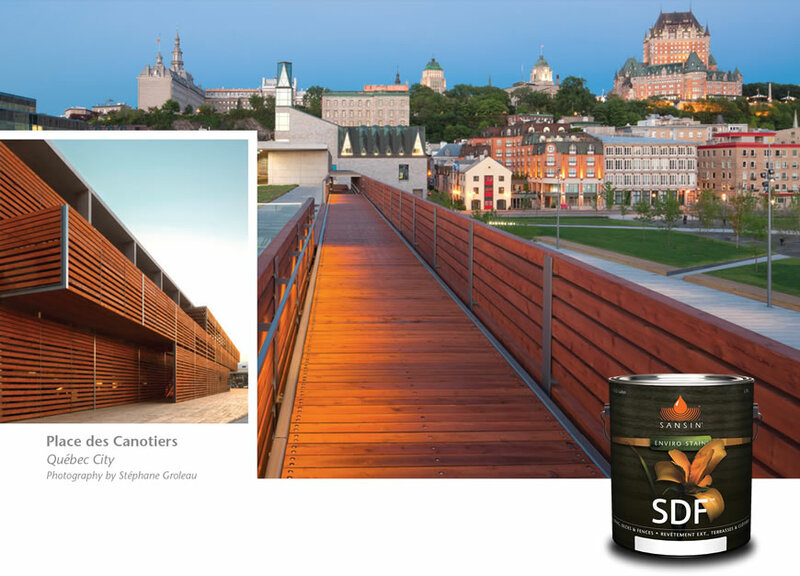 Sansin SDF in a Cedar Tone was selected to beautify and protect this awe-inspiring structure in Québec City.